Cambridge Handy Man And Van – Safe, reliable and professional! We provide a safe, reliable and professional service. We have electrical qualifications, we are CRB checked and Environmental Agency approved. We understand that life can get hectic – especially if you are moving house. We will ease the stress by being available to you 24 hours a day, seven days a week. While other removals companies charge more for evenings, weekends and unsociable hours, we don’t. Our man and a van service covers all aspects of domestic and business relocations, removals of unwanted items, clearance of garden or shed rubbish and transportation of items. Our removals service offers house, flat, studio apartments and room removals as well as business relocations. 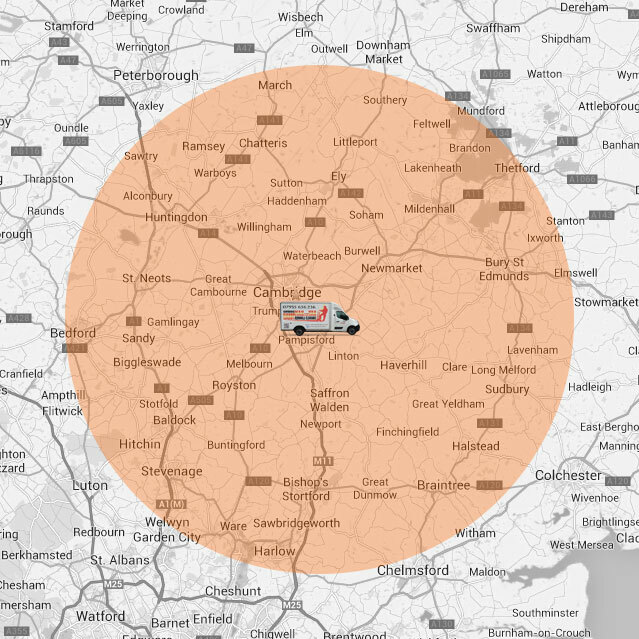 We provide both short and long and large or small removals, within the UK or Europe. We provide a clearance service for household and business waste. We can dispose of anything from furniture, computer equipment to printers and freezers and etc. Whether you need to move one piece of furniture or the entire contents of your room, we will aim to give you the best price and service available. Students will receive a 10% discount on our services. We provide a quick and easy house, garden, garage, attic clearance and waste removal service. We operate seven days a week and our waste removal service is much cheaper than traditional skip hire. Moving between Cambridge or London? We offer a superb removals, delivery and relocation service between the two cities for residential and business customers. We work closely with a number of local and national storage companies. We can arrange this service on your behalf and save you money. If you’ve purchased items and need someone to collect and deliver them for you from the store or post office, we’re here to help. Moving in a hurry? Give us a call – we work every day of the year and won’t charge a premium on holidays or unsociable hours. Need some help with removing or disposing your personal or office items? Call us and we will do it for you for an affordable price. Save money by loading and unloading your items to our van. Our staff will ensure secure loading of items and driving to your location. We offer a number of business services. From office relocation to transport of exhibition stands, we can help your business. If you need boxes or moving materials we can deliver them to you. We can also assist you with packing your items in addition to your move. We also offer a nationwide transportation service and a European service. Please contact us for more details. Friendly, professional service! Highly recommended! Good, quick , end-to-end service with competitive price. I can highly recommend Cambridge Handy Man and Van services. Their booking are very reliable. Greg was fantastic, courteous and extremely helpful . The service was available at very short notice - within 40 mins of the phone call. Excellent service, quotes are very reasonable in comparison to other companies in Cambridge. Highly recommend Cambridge Handy Man and Van. Fantastic service - they were really careful with my furniture, and able to organise a delivery at the very last minute. Thanks! Needed someone urgently the same day. Excellent service, professional. I have moved house 7 times in the 9 years since I came to Cambridge. This was by far the easiest move, thanks in great part to Greg's careful and diligent help. Highly recommended if you're moving house in and around Cambridge! Great service - incredibly helpful and friendly and did a great job. Thanks! Moving's such a head ache! But i had no problems! Friendly helpful service have been recommending non stop since! Thank you again! Great and highly professional service. I would highly recommend Greg and his team to anyone moving house or office (he's moved both of mine in the past 2 months). I have used Greg a number of times over the last couple of years and have always found him friendly, punctual, fast, hardworking and super careful. I will be using him again in the future and can't recommend him highly enough. Thanks Greg! Very efficient and professional. Can be assured of getting the right people for your tasks when you have two promising gentlemen working hard with a very pleasant attitude. Most recommended in Cambridge. Kudos on the electrotechnical competency certification as well. Prompt response to messages, comes round to quote before starting job to ensure price quoted is right. Would recommend! Responsive, flexible, and gets the job done very quickly. Highly recommended. Very good,friendly,helpful and professional.Many thanks. Very friendly and reasonable price. Highly recommend to all. Very helpful and efficient man with a van. Will definitely use him again.